What are treats? Theyre miscellaneous morsels of masters track -- slices of life on the vets circuit that dont quite fit under the News, Views or Meets headings. Like masters track itself, this Web site evolves and grows more professional. I look forward to retirement (around 2019) so I can really get serious about this site. 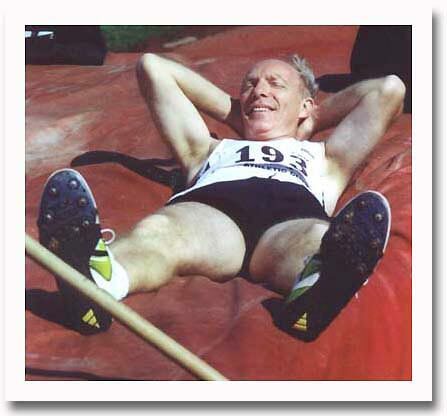 Relax, sit back (like Jorge Birnbaum below at the inaugural Saddleback Masters Relays) and savor my Treats. And come back for more. Theyre not fattening. World-class W40 sprinter and middle-distance runner from Oregon kept track of her experiences at Brisbane 2001, Orono 2002 and Melbourne 2002. Great storytelling, with oodles of photos. World-class sprinter Libal (pictured at the Mt. 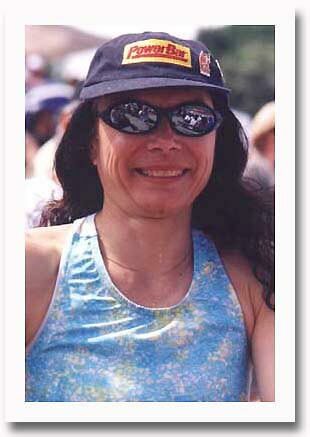 SAC Relays in late 1990s) has overcome chronic fatigue syndrome to set world records and win world titles. Doug Binder tells the Oregon legend's story. Over the Hill Track Club profiled in Cleveland, including Everett Hosack. and may not be reproduced without the express written consent of Masterstrack.com ©.